As some of you may already have seen on our Facebook or Twitter posts, our puppy is much harder on his toys than our older boy ever was. I won't name any brand names here, but some VERY expensive heavy-duty dog toys have lasted for mere minutes in his happy little mouth. I am in no way a pioneer of fleece dog toys (there are many different DIYs out there). After a number of less than robust attempts, we finally made with a toy that both dogs enjoy and is able to survive for weeks of vigorous play, so we though we would try and share some simple visual instructions to help others who would like to try something similar. Mini-update: It has been a few years since we shared this post and now that Humphrey is a little less puppy-destructive and Oli a senior, these types of tug toys last for ages at our place, and wash/wear very well. Fleece is sturdy (as fabrics go), has a nice touch of stretchiness when playing, and could be easily machine washed for a drool-refresh. In less destructive hands (claws...fangs...), these would last much longer. The resulting tug was great for interactive play, the weaving prevented it from being rapidly unravelled as a braided toy might, and the strips were sizeable enough that any pieces that might be ripped off were readily retrieved for the rubbish (supervision required) and unlike typical fabric there are no errant threads. Again, I can't stress enough that supervision and interactivity is a must with this and any toy. Swallowing fabric (or anything else that's difficult to digest) is dangerous as it may lead to a blockage. To weave a basic tug toy, clean fabric is cut into 4 long narrow strips. Note: You can scale the toy to suit your dog by altering the width and/or length of the fleece strips. In the toy shown, I worked with approximately 6-8cm x 2m strips (cut rather uneven...); however, you can make them larger/smaller to suit your dog and the size of fleece you have available. I've made many different shapes/sizes. There is also no need to be too fussy about straight lines when cutting if using scissors. Yay! Loop and knot one end securely, leaving a "tassel" at the end. Repeat until you are approaching the end (not too close though - see tips below!). The top/bottom left/right pattern will cycle naturally from side-to-side with each knot. Loop and knot securely, leaving a "tassel" at the end, and trim if/as needed. Knotting can be confusing if this is your first attempt. You may find it helpful to work with four different colours until you get the hang of things. As an added bonus, that also makes for a pretty result. You can secure the starting/working end to something, if you wish, but personally I prefer to be seated with it nipped between my knees. This allows me to freely flip the strands to the front, back over a shoulder, and from side to side. Don't leave yourself short on the tie-off - you'll need more fabric than you might think! Hello and welcome! Thanks so much for asking. The simplest way to finish the working end is with a very basic "simple" or "overhand" knot (loop around self and pull end through until tight), which is how I finish most of my tug toys. Gather the ends together into a single bunch, loop around the bunch as close as you can to the end of your weave, pass the free ends through the loop, and pull tight. This give you a nice tidy and secure wrap, and is also handy for hanging onto whilst playing. If you are doing a basic tug like this one, you also start with that knot, so it matches up nicely too. You can barely see the end in this toy poking out of Humphrey's mouth :) but the looped ends are visible in some of our other DIY toy photos in case that helps with a visual. It's up to you whether you would like to trim the ends or leave them loose - I often trim to even them out but leave a tantalising little bit of tassel for playtime. This has been the most informative tutorial on square knots I have found. You did everything right with photos and written out descriptions for various types of 'learners'. Thanks for doing such a good job. My puppy and I appreciate it. Awwww thanks so much for that comment, Michelle! :) It's great to hear that you found it easy to follow. Once you have the hang of knotting, it flows naturally and toys come together quickly. It's easy to build on the basics and create fun designs and shapes, or just keep it simple - straight tugs are always a favourite around here. 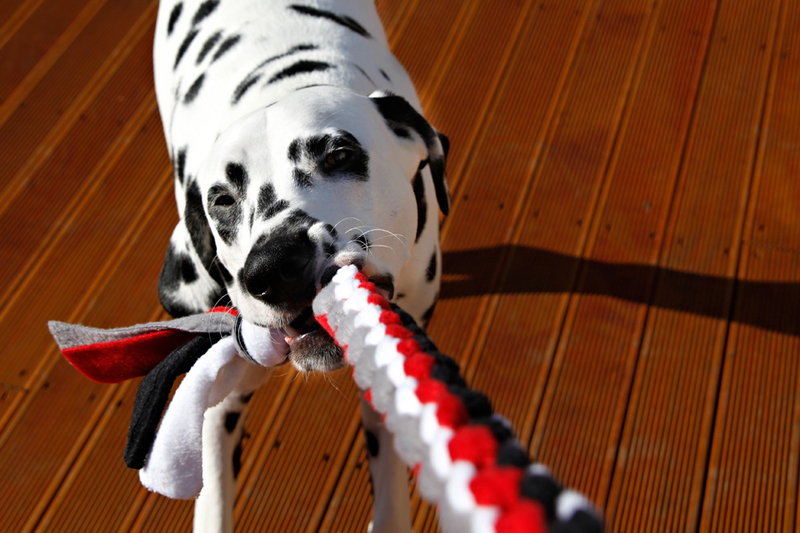 Have fun playing with your puppy and enjoy the new toys! I'm excited, I was feeling overwhelmed trying to figure out other tutorials. I finally found a clear, easy to follow one...yours! Thank you! I'm excited to give it a try. Just wondering if you could help, I love your tug tutorial, it's the best on the net by far. I wanted to make one with a handle, but I'm not too sure how. 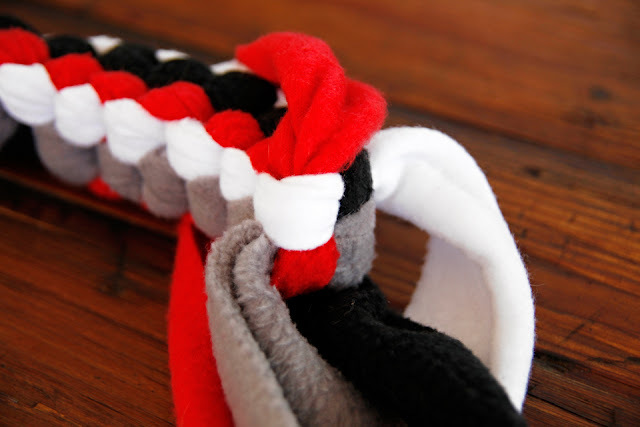 You can easily make the same style of woven toy with one (or more) loops that make great handles. Once you go past a single loop, you start to need very long pieces of fleece to make a decent sized toy for bigger dogs, so you might like to combine/join tugs to make bigger/fancier pieces without needing to buy a giant piece of material. I didn't get how to make the woven toys I see everywhere and then it clicked when I saw you post and pictures that these are like the plastic strip bracelets that were cool when I was in school long ago and now I'm a toy making whizz! :-) Thanks! :) Gimp! I remember it well. Awesome! If you create any fun toy designs, I'd love to see them! By random chance, I saw a great question on a pin to this post on someone else's Pinterest asking about fleece and dog safety. I though I would share a few thoughts here (and invite you to add in the replies if you have useful links for us and our readers). Ultimately, you have to make the decision as to what you feel is suitable for you and your pets. This blog is intended for info/entertainment (i.e. sharing my fun!) only, not for any professional expertise of guidance. Unfortunately, all materials (and toys, bought or made) seem to have pros and cons. 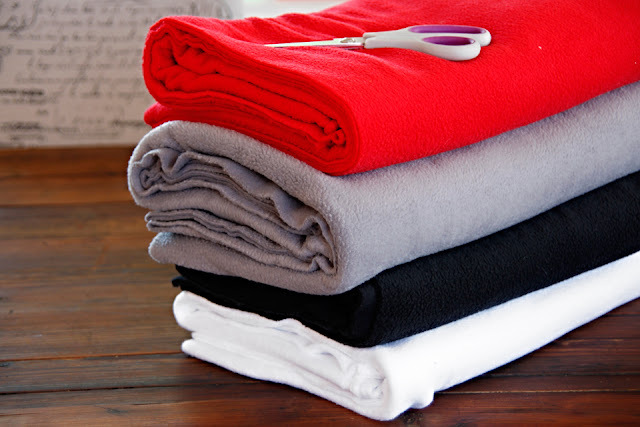 Fleece is durable, colourfast, and doesn't shed threads like woven fabrics, but it is a synthetic material. https://en.wikipedia.org/wiki/Polar_fleece Given it's current widespread usage, including many items for babies and children, there is a lot of information available on material safety if you're keen to Google. There are also some interesting articles on it's environmental pros and cons for those interested. You can, of course, adapt any doggy DIY (from here or anywhere) into another material that you feel comfortable with using and feel is appropriate for your pet. Of course, any toy no matter what it's made of or where it's sourced from also requires dog-by-dog consideration for suitability and supervision during play. If you looking for dog safety information, you might like to check out the Humane Society's guidance http://www.humanesociety.org/animals/dogs/tips/dog_toys.html. Safety Bee's post http://www.safebee.com/family/dog-toys-which-ones-are-safest is a very good read as well. Thank you for the great instructions! How long does it take to make one and would it be very much harder if I had just one color? I have some material that I could use to try it out without buying anything if its possible to do it. Hi there! Personally, it only takes me around 5 minutes to make a basic box knot tug (extra for fancier designs of course); however, I have plenty of experience with making these types of toys and other crafting. If it was your first attempt at a basic average sized single straight tug tug toy, it world probably take you around half an hour. Less if you're crafty, more if your a newbie or a perfectionist. :) It isn't difficult, but it can feel that way at first. With a little experience, the weaving become a natural rhythm and toys come together VERY quickly. You can absolutely use a single colour if you'd like (and it's a good way to hid any little boo-boos in your first weaving attempt - bonus!) It can be a little tricky to remember which strand is going where when you're just starting, which is why I used four colours in the diagram and suggested it may help if you're new to weaving. Good luck, and don't forget to play safe. Love this tutorial!! Easy to understand. One question. I have made a couple of these but the end product was more rounded and the different colors were scattered throughout. Is there a method to getting the colors all in a row as in the red,black,gray, and white? If you are weaving the box knot with a consistent left/right up/down, it will be squarish and in a line, like the pictures for this toy and many of our other tugs. If things are twisting a little (i.e. the strand or the working end of your toy are moving around a little), then that twist gets captured in the weave, which sounds like what you might be experiencing from the description of colour and roundness. Take a peak at our post describing the Basic Box Knot vs. Twisted Box Knot and you can see a side by side picture of of a square tug and a rounded twist tug. The twist effect applied consistently can be used to create a uniform scatter pattern of colours or a diagonal stripe effect. In my personal experience with weaving, the key to getting a consistent pattern, whether it's straight square or twist or other variations, is to keep the working end of your tug securely fixed. I like to work seated in a chair and nip mine between my knees - not fancy, but very effective. :) This allows me to keep my working end fixed while I weave and also gives me space to freely flip the strands to the front/back over a shoulder and outwards from side to side. Hope that helps and good luck with your toys! :) Hooray! So glad it helped! this is awesome I'm sure my dogs will love it, and so will the shelter dogs. Thanks ever so much, Margaret. :) Glad you like it! Hi there! My question is about the size of the toy. I bought one of these for my pup and she loved it! So now I want to make more for her. Using the measurements you did, how long was the toy when finished? I would like hers to be about a foot long or longer. Thanks!!! That's a deceptively tricky question as how long (and wide) your toy will be for a length/width of strips can vary quite a bit depending on both the weight of fleece you use and how tight you make each knot. The measurements above should work nicely for you to make a toy in that size range or bigger. As you can see from the picture with Humphrey, his toy is nice and long (and quite a bit longer when stretched during play). This is the best pet page ever! Brilliant tutorials, the page loads up quick and easy without bombarding the reader with ugly adverts. I will definitely be back for more. Thanks ever so much, Kerrin! :) Glad you like it. So pleased - with your brilliant description and diagram - to have mastered this. I'd looked at quite a few tutorials before I found yours, by far the most clear. Thank you! Hooray! You're very welcome, Janet. Now that's you've nailed it, it's easy to experiment with different colours, shapes, styles, etc for tons of fun toys. Have fun! I have a stock of fabric I bought from The Fabric Exchange .I will try this for sure . Can this toy be washed? Hi there! Assuming your you is made with polar-fleece like the one shown, it is machine washable the same as fleece clothing, blankets, etc would be. If you're using a different material, this may vary case-by-case. When washing or cleaning any dog toy, be selective with your washing liquids/powders and try to avoid anything that will leave residues of strong smells, tastes, or nasty chemicals in general. Hi, I just did a comment, but the page redirected to wordpress so I'm not sure if it worked so I'm doing another! lol. Anyhow, I made this out of 2 old cotton t-shirts and me and my German Shepherd, Bruno, love it! The t-shirts were stretch cotton so I had to actually redo it the first time because when we played with it, it stretched waaay out. So if you are using stretch cotton, I recommend making it super tight! Feels really solid now. Great tutorial, super easy to follow! Cheers! :) Pawesome, Sarah! Thanks for taking the time to share your tip with us and our readers - very helpful. I usually turn to fleece for strength, but recycling t-shirt hems into toys also works well, if the sizes are right. Hubby's tatty old shirts are perfect for this when I'm salvaging the "good bits" for other uses. :) I find that the hems are extra tough compared to the cotton in the body of the shirt. I've never had much joy with the latter, but haven't used stretchy cotton so may try with your tips if I have scrap material in the future. Yay! :) They are just like making the old gimp/cord keychains, dangles, bracelets, etc. we used to make as kids, just on a bigger scale. The more complex patterns of spirals, additional strands, and such work for fleece as well. You can check out our other tugs posts for ideas on weaving styles/patterns as well as turning tugs into fun shapes. Have fun crafting! Hi, could you give the amount of fleece needed for one of these? As in how long and wide does each starting piece for the braid need to be? Thanks so much. Hi Setkat! :) The measurements for the pictured toy are in the italic notes at the start of the instructions, but size is at your discretion so that you can scale the toy to suit your dog by altering the width and/or length of the fleece strips. In the toy shown, I worked with approximately 5-6cm wide x 2m long strips. I wanted a "fat" tug toy for play but also large thick strips for the post pictures. I often use narrower strips and sometimes double (pair eight strips into four sets of two) to get a super thick tug without super thick strips which can start to get cumbersome for tidy weaving as you go wider. You can make them larger/smaller to suit your dog and the size of fleece you have available. I've made many different shapes/sizes. There is also no need to be too fussy about straight lines when cutting if using scissors. Yay! How long do your dogs toys last? How often do you clean them? Hi there! How long our toys last with our boys varies a lot depending on how popular the toy is in the toy box rotation (Humphrey has favourites), how robust it is, the vigor of play, and whether it has a squeaker (always a finite lifespan for stuffed toys). When Humphrey was a pup and Oli was also more playful, they were very rough indeed but now (3 and 11), a toy like this can last a very long time at our place. We have tugs in the toybox that are over a year old and still going strong. So good! I do routine first aid on the boys toys if/as required when I notice damage/wear during play and do a regular sweep of the full toybox when I wash/clean all of their toys (reknotting, trimming ends, etc). I also keep a toy hospital basket for repair and salvage. I clean on an ad-hoc basis when needed if things look grubby or someone has been ill. If they haven't been cleaned in a while, I do it maybe every couple of weeks when the weather cooperates. I should probably do it more for some! :) We don't use food/treat toys (competition problem with the current age/energy gap), but when we did those were washed after every use. As shared in our post on keeping a (mostly) clean pet-friendly home, depending on the toy, this may involve simple laundry (soft/plush toys or fabric tug toys, use a sweater/lingerie sack if needed for smaller items), a cycle through dishwasher (solid toys of dishwasher safe materials), or handwashing (complex shapes that are best scrubbed, squeakers to avoid filling with water). Be careful with your choice of cleaning products as they may linger on/in the toys leaving nasty chemicals, scents your dog dislikes, or icky tastes. Skip the chemicals or use something non-toxic and make sure it is thoroughly rinsed away before drying. If needed, I do a double wash with cleaners and then a re-wash with either plain water or add in baking soda/vinegar. For each layer of a four-strand square weave, the steps are exactly the same. The vertical (top/bottom) strips stay vertical and the horizontal (left/right) strips stay horizontal, they just flip flop their + positions relative to the center of your tug each time: top becomes bottom, left becomes right every time. During this movement, each strip creates a single loop over and tuck under the perpendicular pair. Each passing of the strips over (creates the visible "bumps" of the tug) and under (and in doing so securing them in place) as they move back and forth in this flip flop creates a layer in your tug toy. - black is on the left, folds to the right, passing over the folded grey strip and under the folded white strip. 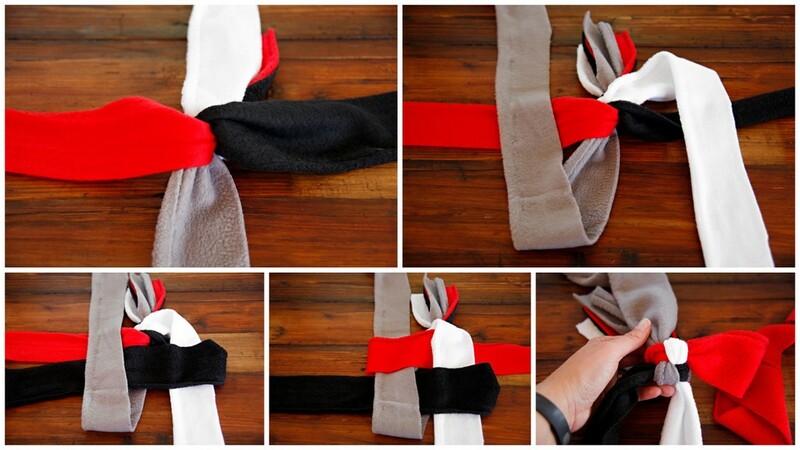 - red is on the left, folds to the right, passing over the folded white strip and under the folded grey strip. The strips are now back in the same position as the diagram. The up/down left/right cycle continues for each layer you create. Thank you for sharing, I finally found a simple and practical tutorial.